Ideas for Home Decorating: Adding Fabric Textures! Adding burlap fabric, toile fabric, vintage or modern upholstery fabric all help to create mood and interest in a room. The simple decorating technique of layering different fabric textures is worth using in every room. By mixing your fabrics; adding some sheer fabric, a little faux fur fabric or a quilted fabric, you can create simple, relaxed and very inviting spaces. With some fabric swathes and a color palette, this one decorating technique can make over any room quickly in a highly original way. The layers of different fabrics and pops of color can make your decorating go from flat to amazing without too much effort. First look at your room and the existing colors in your color palette and use those to expand layer patterns and textures. 4. Choose three or four different things you can swap our regularly to change the textural look of your room. Rooms that layer fabric textures make them feels 'finished', almost polished, even if the simplest tones or hues are selected. Combining fabric textures creates an interplay of surfaces. They balance and rival each other; creating a room a unique look and character. 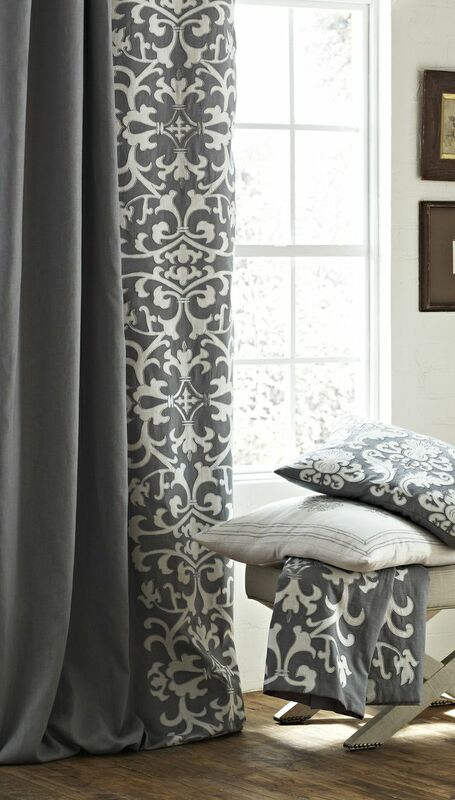 The fabrics you choose add layers to the decorative scheme, style and mood of the room. If you are after a cozy comfortable look, then wood, plush fabrics, woven rugs and natural fabrics will add texture to a room. If your prefer a sleeker, modern look use metals, glass and lacquers. The best rooms have a perfect balance of both. Most investment or foundation pieces; like your sofa, rugs or drapes, are pieces you don't update often. Use those pieces as your base. Because of this, they are often in single color fabrics and all other color choices are based on these basic pieces. It doesn't mean you are limited or stuck forever to a tiny color palette. Use these as your base, and expand them, using different patterns, tones and adding other colors. It's too easy to limit yourself to those few colors - but its time to think outside the box. Adding texture is one way to do this, adding patterns is another and adding accent colors is a third to get the most out of your existing color scheme. Take a close look at the different colors that make up your sofa, rug or drapes. There can be up to twelve different colors that make up your piece of fabric; shades or strands of blue, a range of pinks, maybe some other creams in the color wheel that you can introduce to other pieces. Look at the tone and mood of the piece and build from there. 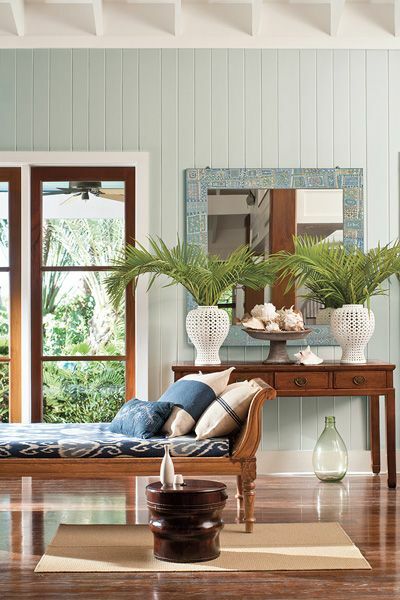 It's easy to introduce a range of patterned fabrics, swap out accent colors and bring in new colors for each season. Fun or bright colors for spring and softer colors for winter. Just one panel of fabric can make all the difference. Swap this piece of gray and white drapery below for orange, soft blue sheer fabric or strong green ticking stripe fabric and you have a completely different look. Select up to twelve colors, including tones and shades of colors, using only 3-4 of these as your main fabric colors and the rest as small accents. This is easy to do - even with whites - each shade is one of your 12 colors. Fabric texture can add and transform the mood within a room. Think of using gingham fabric, plaid fabric or even a toile fabric and you have a completely different mood to using paisley, jacquard or shiny modern upholstery fabric. Mix fabrics. 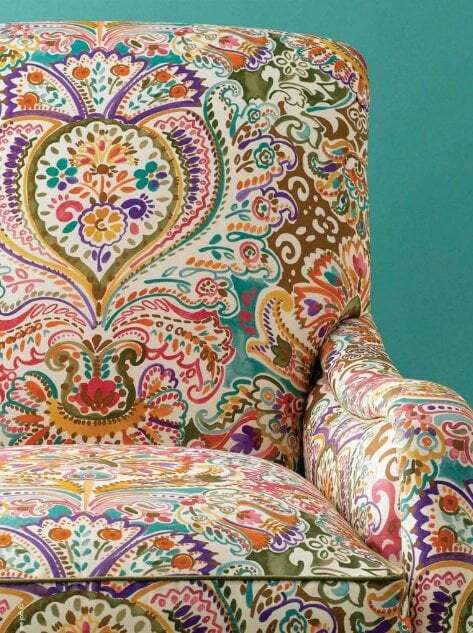 If you have a muted room then one strong piece in paisley will really stand out as a feature. 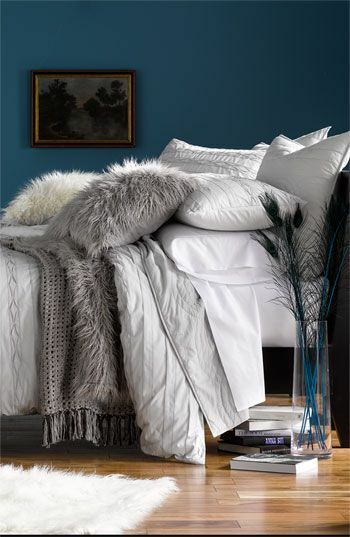 But if you want to keep your muted look, then use lots of different textures in the same muted color palette. This is important so you do not get a flat, dull looking room. Every fabric you choose has a textural weight, so it's worth spending some time to work out colors your room can take and layering your look. Heavier weights work better for colder months while lighter weights are fresh and perfect for spring and summer. Now its time to add smaller items like cushions, ottoman, runners or rugs. Each one adding to your foundation colors and building your texture bank balance. 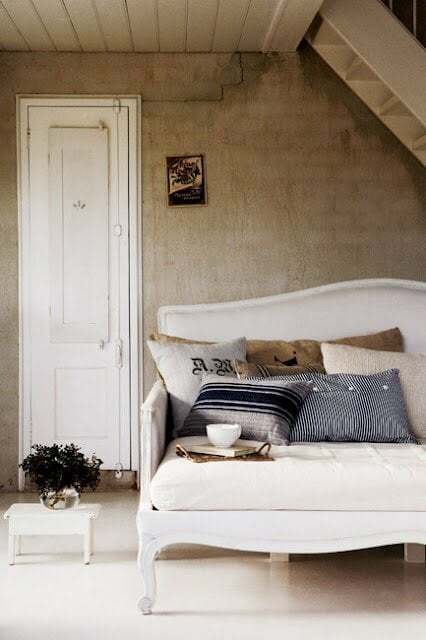 Cushions are a great place to start, especially if you are happy to swap them in and out for different seasons. 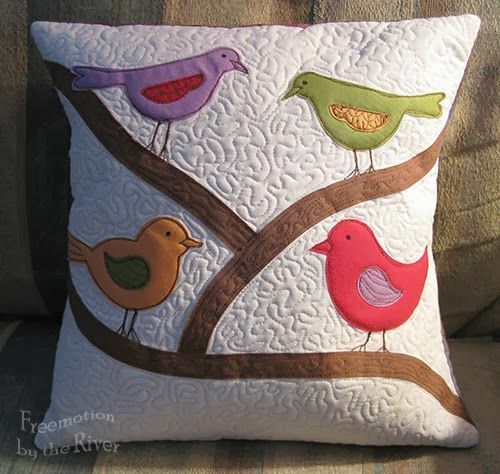 Even better if you can make them like this cushion made using accuquilt. 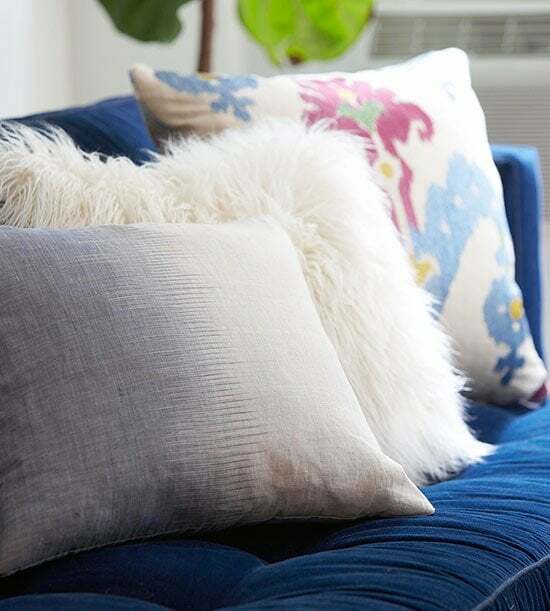 Cushions are the easiest and least expensive items to swap for a winter or summer look. There are endless possible fabric combinations that you can play with such as the contrast of hard and soft textures like cashmere throw against a leather chair or a quilted cushion on a tightly upholstered sofa. Remember, not everything has to match but there needs to be a sympathetic blending of colors, patterns or tones that makes them happily sit together. If your decor is more traditional style then add to your woven wools with smooth silks, gilded frames, cut crystal, and polished wood. 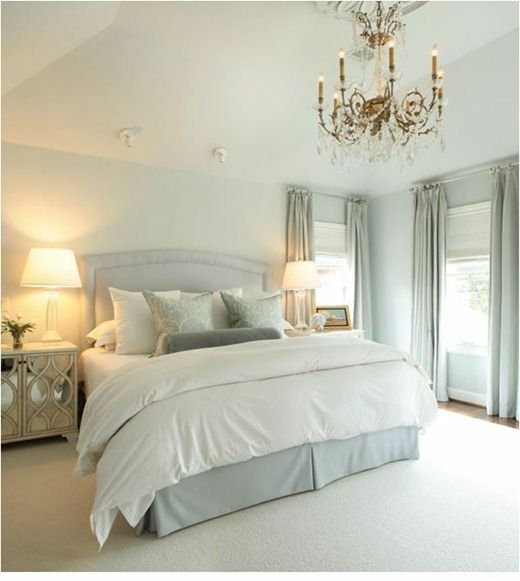 To keep the tone of your room make sure your new fabrics are in keeping. 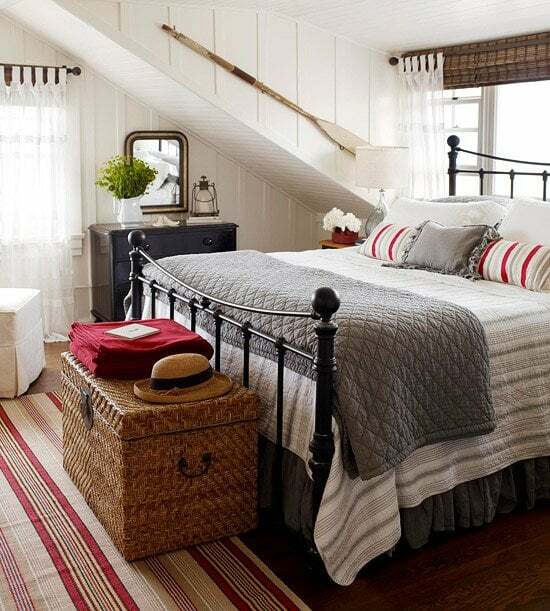 Country styled rooms use more chenille, ticking and weathered or rustic wood. Successful rooms have a focal point. Some rooms have natural architectural features, like high ceilings, a fireplace or grand windows. Some things become a focal point because of size, unique design, shape or color. Large solid pieces of furniture, like a bed, sofa or cabinet ground the room, but unless they are unique are often not the ideal focal point for any room. This is where fabric comes in. If your room lacks a focal point, think of using fabric to draw in the eye and create a new point of interest. Its a less expensive alternative, can be changed regularly, added to or subtracted from for new different looks each time. By now you I hope you see the value of using fabric texture in your home decorating. But a word of caution. It should be used in moderation. Knowing where to start is important, but knowing when to stop is vital. If you enjoyed this article or have some stories or tips on using fabric textures, decorating with texture, types of home decorating fabrics you use, and decorating techniques on how to decorate using textured fabrics, please leave a comment below. If you want to read more about fabrics you can learn all about how to use fabric patterns here. Please Like or share this article if you did!! OMG i love love love that green sofa chair. Wonder where I can get it?! It's Italian but out of stock. Sorry.